Leave it to four Emory Scholars to integrate the liberal arts mission of the Emory College of Arts and Sciences into a challenge to solve some of the globe’s toughest problems. 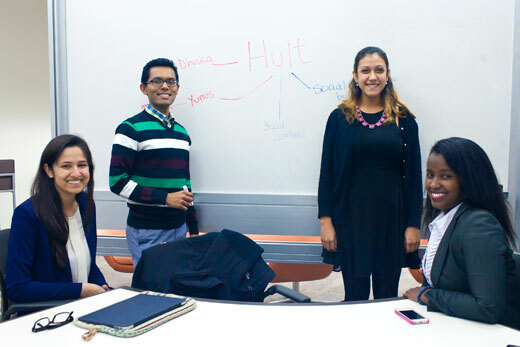 A four-member team – sophomores Safiyah Bharwani, Rachel Citrin and Victoria Umutoni and senior Rifat Mursalin – travels to Shanghai next month to face off against 350 other student teams worldwide for the Hult Prize. The annual competition awards $1 million in start-up funds to the best idea for a profitable business that does social good. Their challenge: create a business that doubles the income of 10 million people living in crowded urban spaces worldwide. Their advantage in the battle for $1 million in start-up funding: Emory’s emphasis on service and inquiry, and combining those traits. But it’s more than just coming up with a good idea, adds Citrin, a Martin Luther King Scholar from Atlanta majoring in political science and Middle Eastern and South Asian studies. For the foursome, their common backstory involves efforts to have an impact on the broader world. Bharwani’s interest in social action came from her parents, Indian immigrants who encouraged her to give back on trips to their homeland and her own volunteer trip to Mombasa, Kenya, to work with special needs students. A Woodruff Scholar from Sugarland, Texas, majoring in economics and math/political science, Bharwani talked to members of Emory’s Hult Prize team from last year and began having discussions with Umutoni about general ideas to launch this year’s effort. True to their intellectual backgrounds, the pair researched global slums and past successful start-ups. They found the enterprises most likely to make a difference focused on the developing world – nations in South Asia and Latin America whose existing infrastructure and political stability could be leveraged. They found Citrin and Mursalin after posting for like-minded students in the Emory Scholars newsletter. Citrin, like Bharwani, always envisioned being an entrepreneur whose business included social good in the bottom line. She spent a gap year studying Arabic in Oman on a U.S. State Department scholarship. She knew firsthand the importance of understanding local culture to get buy-in for any project. Mursalin, a Martin Luther King Scholar majoring in economics and French, was different. He grew up in Dhaka, Bangladesh. After his family moved to Atlanta when he was 13, he imagined a future in banking and consulting, not one focused on the crowded world he had left. The team leaves March 5 to compete in the Hult Prize regional competition in Shanghai, which begins March 11. Regional rounds will also be held that day in Boston, San Francisco, London and Dubai. Approximately 50-60 teams per region will then move on to the next phase in the competition. The Emory students' plan is deceptively simple. They propose building a business incubator space – itself a luxury in crowded slums. But instead of focusing on any one problem, such as trash or hygiene, the incubator will accept applications from locals with plans to solve whatever specific issue they deem important to that community. Those ideas could be simple businesses or the start of larger operations. The goal is to build the connections, both in and out of the slums, which can lead to action. While early investment will come from non-governmental organizations or businesses, the incubator would take a percentage of each project to jumpstart the next idea. The idea mimics previously successful concepts, such as the microfinance wave of tiny loans to the poor (usually for business or other investment). But it also somewhat replicates the experience of the Scholars. Coming to campus by way of Kigali and Dhaka, Texas and Georgia, their paths brought them to a place where they could discuss their experiences and ideas and, just as importantly for them, do something with them.